Authors’ Note: Ms. Katie C. Lewis and Dr. Lisa Wallner Samstag are affiliated with Long Island University in Brooklyn, NY. The ethical issues involved in writing about clients are complex and were the topic of a recent special section of Psychotherapy, Division 29’s Journal (Samstag, 2012). The five papers in the series (Barnett, 2012; Blechner, 2012; Fischer, 2012; Sieck, 2012; and Woodhouse, 2012) identified a number of implications of a) obtaining consent from a client to present clinical material in a publication or conference, and b) of disguising the material, which are two options to consider according to the American Psychological Association’s Ethical Principles of Psychologists and Conduct Code (2010; Standard 4.07). For instance, seeking consent might not be appropriate or possible with certain clients, and the extent to which clinical material is disguised and even “falsified” (Blechner, 2012) threatens the integrity of the material, presenting ethical dilemmas for clinical writers. Although the clinical writing practices of experienced professionals have received considerable attention in the literature (e.g., Aron, 2000; Duffy, 2010; Gabbard, 2000; Kantrowitz, 2006), little is known about the practices of psychology graduate students, a surprising fact, given that graduate students are required to write about clients in the course of their training. Clinical writing at the graduate level is done in a number of different contexts, including: 1) direct clinical care (e.g., clinical reports and progress notes evaluated by supervisors), 2) specific academic requirements, such as for classroom assignments or clinical qualifying examination, and 3) as part of applications for clinical training positions (e.g., required externships and internships). Understanding the particular issues faced by clinical graduate students, and how they approach the preparation and use of clinical writing samples—particularly when they are required to share these materials with professional audiences outside of their home doctoral institution—is of great importance, both in terms of protecting client confidentiality and anonymity and evaluating current educational practices. Approaching a client about obtaining consent and appropriately disguising clinical material are sophisticated clinical skills for which graduate students may be ill prepared within current training curricula (Lewis, 2012, 2013; Samstag, 2013). Students who are required to use clinical writing samples as a part of their training are faced with unique challenges compared to psychologists at later stages of their careers. Although many student writing assignments are written for an audience limited to professors of clinical courses or clinical supervisors, who are also mandated to follow rules of confidentiality and anonymity, clinical writing samples (e.g., intake reports, treatment summaries) are increasingly required as part of applications to training sites, exposing the material to a wider reading audience. The field must be cognizant of potential ethical dilemmas facing students. First, compared to experienced professionals, students will have considerably fewer choices in terms of appropriate clients from whom to seek consent, especially early in their academic careers. 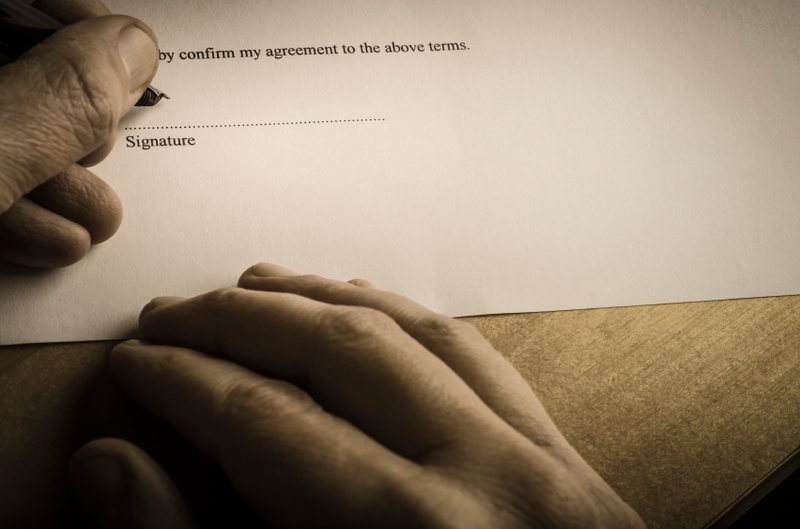 If truly informed consent is difficult or impossible to obtain for ethical or clinical reasons, disguising the material may be the student’s only option when facing a clinical writing requirement. The second issue refers to the kind of supervision the student receives about how to disguise clinical material. Since students must demonstrate proficiency in developing case formulations or diagnostic and treatment reports using accurate clinical data, understanding how material that has been altered, and possibly falsified, may compromise an evaluation of the student’s training experience is of utmost importance. To date, there are no guidelines for clinical supervisors about how this should be done. Students, like professionals, may consult official guidelines for confidentiality outlined in the Health Insurance Portability and Accountability Act (HIPAA, 1996). However, HIPAA guidelines do not provide clarity around how to adequately protect client confidentiality: “removing all of the identifiers, which are typically found on a patient’s medical chart, is not likely to de-identify a counseling or psychotherapy client because of the uniquely personal nature of the information that is the focus [of most reports]” (Duffy, 2010, p. 145). Third, students may not have information from training sites regarding how the site will safeguard confidential clinical information—for instance, who will read the material (which is typically submitted electronically), where it will be stored, and when it will be destroyed. Uncertainty about these aspects of the application process and training requirements may lead to over-disguising or extensively falsifying information in the service of client protection, which, as mentioned above, threatens the integrity of the material submitted as an example of the student’s clinical formulation ability. Important questions remain about the relative competency of students in deciding whether and how clinical information should be altered in the documents they submit to training sites (Sperry, Hartshorne, & Watts, 2010). Others have described the inherent problems associated with using disguise as an approach to the maintenance of confidentiality (Duffy, 2010; Fisher, 2008), as clinicians, and especially clinicians-in-training, “cannot know in advance which details of the material will be significant in the case when considered by another clinician” (Blechner, 2012, p. 16). The current study was designed as a pilot investigation to identify the issues faced by a sample of graduate students required to submit clinical writing samples as part of externship and internship applications, and to survey the current ethical practices of students who submitted such writing samples. Specifically, we sought to sample information about: (1) how different approaches to client confidentiality are taught in graduate training; (2) how students handled the protection of sensitive client information when preparing documents for submission to training sites; and (3) how students think about the maintenance of their clients’ confidentiality when deciding how to address the protection of private information in these clinical writing samples. Doctoral students in clinical and counseling psychology programs (PhD and PsyD) were contacted by e-mail through their Directors of Clinical Training (DCT), with an invitation to participate in an online survey investigating how students utilized clinical writing samples in their applications to clinical externship and internship sites. DCTS from 130 Clinical Psychology PhD and PsyD programs, and 65 Counseling Psychology PhD and PsyD programs, were contacted over a 3-month period with a request to forward a call for participation to their students; 3 DCTs indicated a refusal to participate. Students were eligible to participate if they were the age of legal consent, currently enrolled in either a clinical or counseling psychology doctoral program, and if they had at least one year of experience in applying to training sites that were external to their home doctoral institution (e.g., clinical externship or internship). Participants were provided with a secure link to a 32-item survey created by the authors (see Measure section), hosted by the secure data collection and storage website Qualtrics. A total of 118 participants logged onto the site and n=86 eligible participants completed the survey; partial data for 19 eligible subjects who started but did not complete the survey were also included, for a total sample of N=105 doctoral students. All participants provided informed consent via electronic signature prior to completing the survey and were offered the opportunity to provide their e-mail addresses at the end of the survey for a chance to win one of two $50 gift certificates; their e-mail addresses were not linked to their survey responses, and no other identifying information was requested. The final sample included n=78 (69%) clinical psychology, n=35 (31%) counseling students, divided into n=97 (86%) seeking PhD’s and n=16 (14%) seeking PsyD’s. The demographics of the sample were n=74 (82.2%) women with a mean age of 30 years (SD=4.7, range 24-55 years). The ethnic composition of the sample was n=69 (76.7%) Caucasian/White, n=9 (10%) Hispanic/Latino/a, n=6 (6.7%) African American/Black, with other ethnicities including Asian American (n=1; 0.8%) and Arab American (n=1; 0.8%) also represented. All participants reported that their current doctoral program was APA-accredited. Participants had an average of 203 hours of individual supervision (SD=153) and 194 hours of group supervision (SD=281) for all clinical work. Most of respondents (n=78; 92%) indicated that they had been successful in obtaining a clinical training placement for the upcoming training year. The authors developed a 32-item survey specifically for the current study, with two items requesting open-ended responses from participants about the details of their decision-making process when preparing reports (see Results). The survey was divided into five general sections: (1) demographic information; (2) types of sites that students had applied to and type of clinical writing samples included in the most recent application cycle; (3) selection of specific approaches for confidentiality maintenance in the materials used; (4) communication with clients and/or to training sites about the use of clinical material used for application purposes; and (5) graduate training in confidentiality practices. 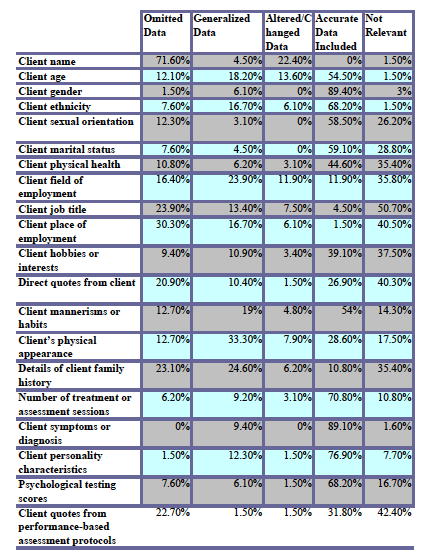 The types of identifying clinical data that were asked about in the survey were developed both with reference to HIPAA’s (1996) list of identifiers (e.g., client name, ethnicity, field of employment), as well as other potentially identifying information that would typically be included in a case formulation or description of psychotherapy (e.g., details of personality characteristics, client mannerisms, family history). Because participants were not required to respond to every item of the survey, results are presented both in frequencies and percentage of participants responding; no participant was removed from the study due to incomplete data. Results are presented first regarding applicant and training site details within the current sample, followed by the frequency and general type of clinical writing samples utilized by students. The specific practices of participants who submitted writing samples to external training sites are then examined, with participant responses to selected open-ended questions provided for additional qualitative detail. Participants were primarily in the advanced stages of their doctoral program (4th year and beyond: n=74; 83.1%). Approximately half of the sample had experience applying to predoctoral internships in addition to formal practica/externships (pre-internship clinical training) (n=49, 49%). Over half of the sample reported that they had applied to either externship (n=35, 39.3%) or predoctoral internship positions (n=34, 38.2%) during the most recent training year (2013-2014). Participants most frequently reported that they had applied to academic medical centers (n=50, 42.4%), community mental health clinics (n=34, 28.8%), private psychiatric hospitals (n=33, 28%), Veterans Affairs Medical Centers (n=28, 23.7%) and university counseling centers (n=27, 22.9%). Seventeen participants (14.4%) indicated that they had submitted applications to other types of training sites, including state and forensic hospitals, psychoanalytic institutions, private practices, nursing homes, partial hospital programs, schools, and research centers. The vast majority of participants reported that the training sites they applied to required some kind of clinical writing sample as a supplement to their standard application form (n=69, 78.4%); the most common materials requested included psychological testing reports (n=62, 52.5%), clinical case summaries (n=42, 35.6%), and psychotherapy assessment reports such as intake or discharge summaries (n=34, 28.8%). Many participants indicated that training sites requested supplemental materials that directly or indirectly asked them to discuss their clinical work and experiences, such as in essays related to personal or professional identity development (n=37, 31.4%), writing responses to clinical prompts (e.g., “describe a challenging case;” n=9, 7.6%), or papers written for academic course work (n=3, 2.5%). The majority of participants who were required to include clinical writing samples in their applications indicated that they had submitted clinical documents completed at a former external training site (e.g., an intake report from a practicum site) (n=47, 69.1%); relatively fewer participants also reported using class assignments (n=6, 8.8%) or original documents created solely for application purposes (n=10, 14.7%). 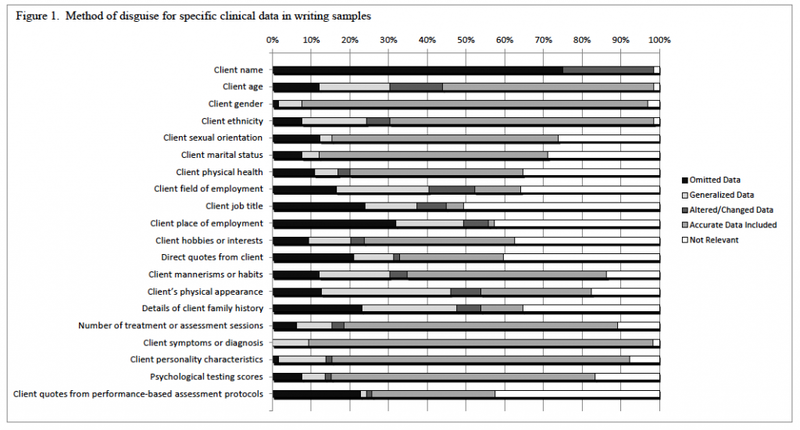 Clinical writing samples were most frequently about adult clients seen in individual psychotherapy (n=55, 79.7%), although adolescent (n=22, 31.9%) and child clients (n=19, 27.5%) were also frequently written about. Two participants (2.9%) reported that they had written about a fictional client in their submitted reports. Participants, therefore, most frequently reported that they had included existing, authentic clinical documents from their clients’ medical records in their applications to training sites, rather than writing samples created solely for application purposes. The majority of participants reported that their doctoral programs did not require them to have a mentor or supervisor approve their clinical materials for application purposes (n=56, 82.4%; an additional n=5 participants [7.4%] were unsure if this was a requirement). Nonetheless, many participants stated that they had relied on a variety of professional resources when preparing their writing samples for submission, with 43.3% of participants (n=23) indicating that they had consulted at least some form of professional confidentiality guidelines, including APA and HIPAA guidelines, guidelines provided by their home doctoral institution or the training site to which they were applying, or recommendations for applicants presented at state psychological association meetings. When initially selecting which clinical writing samples to use, just over half of the participants indicated that they did not consult with anyone, instead making their decision independently (n=36, 52.2%). Participants who did seek input from others on which clinical writing samples to use most frequently asked for the assistance of peers (n=15, 21.8%), academic advisor or mentors (n=14, 20.3%), clinical supervisors (n=12, 17.4%), and/or DCTs (n=10, 14.5%). A smaller percentage of participants indicated that they had requested the assistance of family members or friends (n=2, 2.9%) or their personal therapist (n=2, 2.9%) when deciding which clinical writing samples to use. Similar frequencies were found when students were asked about whom they consulted when editing and preparing their clinical writing samples for submission. While a little over half of participants reported that they prepared clinical documents without guidance from another person (n=40, 58.0%), others stated that their peers (n=14, 20.3%), clinical supervisors (n=12, 17.4%), academic advisors (n=12, 17.4%), and/or DCTs (n=10, 14.5%) assisted them in preparing and proof-reading their clinical writing samples prior to submission. Although family members and friends were again noted as providing help to some participants (n=6, 8.7%), personal therapists were not indicated as being a resource of help during the document preparation phase, and no participants indicated that they had solicited input from the client about whom they wrote. These results indicate that nearly 2 out of every 3 applicants submitted their clinical writing samples without soliciting the help or input of an experienced clinician or a representative from either their clinical training site or doctoral program. Participants were asked to indicate which clinical data they most often disguised or omitted for purposes of confidentiality in their clinical writing samples. Results are presented in Figure 1. Respondents most frequently reported that they had omitted details such as client name (n=48, 71.6%), specific place of employment (n=20, 30.3%), and job title (n=16, 23.9%); they were more likely to generalize, rather than present specific details, information about their clients’ physical appearance (n=21, 33.3%), family history (n=16, 23.2%) and field of employment (n=16, 23.2%). Participants were most likely to include accurate and specific information about their clients’ psychiatric symptoms (n=57, 89.1%) and treatment history (n=46, 70.8%), as well as their psychological testing scores (n=45, 68.2%). The details most frequently changed or altered included client name (n=15, 22.4%), age (n=9, 13.6%), and field of employment (n=8, 11.9%). In sum, although participants reportedly used a range of approaches when de-identifying clinical documents, most frequently they reported either omitting potentially identifying details or simply retaining accurate information within their reports (see Figure 1). To a lesser degree, generalizing information and altering or changing clinical details were also used. Nearly half of all participants (n=31, 46.3%) reported that they had not directly informed application sites that they had in any way falsified their clinical writing samples in the service of confidentiality. Participants were asked about whether or not they had considered approaching their clients to obtain informed consent for the use of their materials specifically for professional application purposes. Only 2 participants (2.9%) indicated that this possibility had been discussed in the context of their clinical supervision, and only 2 (different) participants reported that they had actually addressed the issue directly with their clients. Participants who did not discuss the use of clinical writing samples with their clients were asked to rank-order their reasons for not doing so (see Table 1), with results showing both practical concerns, such as no longer having contact with the client, as well as treatment-related concerns, such as fears that the request would feel coercive to the client or disrupt the treatment. In general, though participants reported that their status as a trainee was clear to their clients, the extent to which clients understood the implications of this in regards to the potential use of their information by the student for other training purposes was far less certain. Participants were also asked in an open-ended item to provide information describing their reasons for not seeking informed consent from their clients for the use of their materials for application purposes. Although some respondents (n=2, 11.8%) stated that the idea of obtaining informed consent from their clients “never crossed [their] mind,” others argued that the use of disguised information absolved them from having to obtain direct permission from their clients, stating for example that “[they] didn’t think [they] needed to since all the information was disguised,” and that “[the information] was not identifiable, and therefore did not require informed consent.” Others indicated that permission for use of client data was included in the initial informed consent for treatment, or that permission to use a de-identified report had been granted by their clinical supervisor. Overall, participant responses reflected that seeking informed consent was less often considered as an ethical option when using client data, with clear preference given to the use of disguise in the preparation of clinical writing samples for applications sites. Participants who applied to predoctoral psychology internships (n=49, 49%) were asked to indicate whether and how they had used clinical material in the four essays required as part of the Association of Psychology Postdoctoral and Internship Centers’ (APPIC) Application for Psychology Internships (AAPI). The majority of respondents indicated that they had referred to clinical experiences in at least one of the four essays, most frequently the Theoretical Orientation essay (n=31, 63.3%) and the Multicultural/Diversity issues essay (n=30, 61.2%); participants less frequently referred to clinical case material in their Autobiographical essay (n=4, 8.2%) and Research Experience essay (n=2, 4.1%). Details about the type of clinical information most frequently included in these essays are reported in Table 2. Unlike the preparation of supplemental clinical writing samples, internship applicants tended more often than not to include others in the editing and review process of their internship essays, with 28.6% of respondents (n=14) eliciting help from their academic mentors, 18.4% (n=9) requesting help from peers, 12.2% (n=6) obtaining input from their DCT, and 10.2% (n=5) requesting help from their clinical supervisors. Only 12.2% (n=6) stated that they did not receive help or input from anyone while preparing their internship essays. These findings suggest that students are more likely to solicit the input and assistance from experienced clinical professionals when preparing their four APPIC essays for internship applications, in comparison to their practices when submitting original clinical reports more generally to clinical training sites. Participants were asked to discuss how various approaches to confidentiality practices in clinical writing had been discussed in their graduate training. The majority of participants (n=75, 63.6%) indicated that confidentiality issues had been discussed in the context of a required Professional Ethics course; further details on the source of education and training in the ethics of clinical writing are presented in Figure 2. Although nearly half of all participants felt that their programs had at least “adequately” addressed the benefits and limitations of changing client information in clinical reports (n=38, 44.2%), a majority reported that the pros and cons associated with utilizing composite cases were addressed “only briefly” or “never” (n=59, 69.4%). Nonetheless, participants largely felt that overall they were at least “somewhat familiar” with the confidentiality practices outlined within the APA Ethics Code (n=77, 91.7%) and HIPAA guidelines (n=95, 100%). 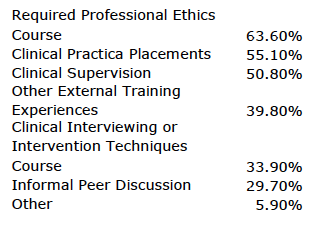 Despite the clear paucity of discussion of confidentiality and clinical writing in the context of direct clinical supervision, students reported that the didactic training they had received on these issues, and their general familiarity with professional ethics codes, was “adequate” in preparing them on appropriate ethical practices. The current study is the first to our knowledge to survey the confidentiality practices of doctoral students who submit clinical writing samples as part of their applications to external training sites. Although our sample was limited in size and included participants from only APA-accredited programs, our results reveal important information about how students approach the maintenance of client privacy in the clinical writing samples they use for training application purposes. These data point to possible gaps in graduate school education and clinical training. The implications for training, as well as recommendations for the field, are discussed below. One of the more concerning results to emerge from our data was the finding that the majority of student applicants did not consult any experienced clinician, supervisor, or professional resource (e.g., HIPAA or APA guidelines) prior to submitting their clinical reports to training sites, and when they did consult with others, it was usually their peers. This finding suggests that most of the time, students decide for themselves whether a clinical document has been sufficiently disguised. Thus, the extent to which clients’ sensitive clinical information is protected, and the extent to which students’ clinical proficiency skills may be obscured in the clinical documents that are typically sent to training sites via e-mail, is currently unknown. These findings have additional implications for clinical supervisors. For instance, Thomas (2010) has argued that one of the roles of a clinical supervisor is to assume the role of “gatekeeper” for their student trainees, serving as both a model of good professional practices while ensuring that these practices are put into effect by the student. Other writers have considered supervision as a form of “intervention” (Bernard & Goodyear, 2014), designed not only to support the student in their training but to actively monitor professional functioning and development. Clinical supervisors must meet their students’ training needs while protecting the needs of the clients with whom their students work, and sometimes there may be conflicts in these imperatives. The findings in the current survey suggest that guidelines for supervisors and graduate faculty regarding the dilemmas faced by graduate students required to demonstrate proficiency in clinical writing should be developed. Although students in this survey reported frequently using omission, generalization, and falsification to disguise sensitive material in their clinical reports, there was little data suggesting that these changes had been made in a thoughtful or systematic way under the guidance of an experienced supervisor or faculty member. Students may not have sufficient knowledge or experience to manage the challenges of confidentiality maintenance in clinical writing or to understand the broader consequences of their available choices. Greater emphasis on the ethical issues associated with clinical writing must be included in clinical supervision and academic contexts in order to prepare students for appropriate ethical practices as independent professionals. Ethical considerations in clinical writing samples should be addressed early in graduate training, in the context of a required ethics course. This would ensure that students develop an awareness of confidentiality issues related to the use of clinical documents for professional and application purposes prior to encountering any formal requirements to submit these documents to training sites. Students could be provided with samples of de-identified documents that address the specific issues of omission versus disguise, and benefit from having a forum in which to discuss the question of when, whether and how to obtain informed consent directly from clients for clinical writing purposes. Students should be required to have a faculty member at their doctoral training program approve all clinical materials submitted for externship and internship applications, and guidelines for how to disguise that material (or alternately, how to communicate that informed consent from the client was obtained) should be developed and incorporated into students’ clinical training early in their academic careers. Input from both academic programs and clinical training sites should be considered in developing such guidelines, although doctoral programs are arguably in the strongest position to assume the lead in developing and implementing such measures. 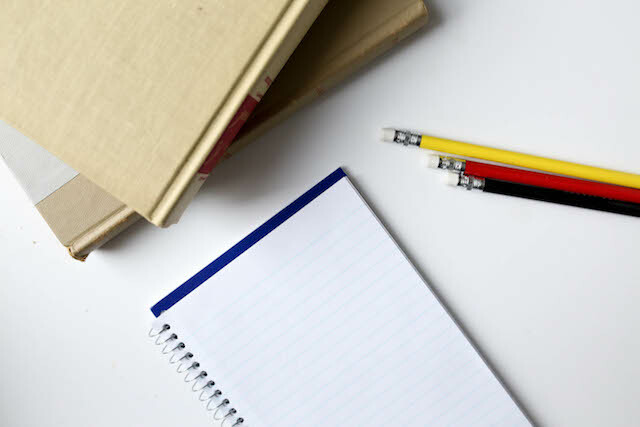 Such guidelines could, for example, be utilized within an early ethics course as study material, and later referred to during the application process to ensure that students have followed these guidelines prior to submitting any documents. Communicating these guidelines to clinical supervisors at external training sites—and ensuring that these standards also meet the confidentiality practices of the training institution—would provide greater awareness of these issues, and foster greater collaboration between those individuals most directly responsible for students’ training and professional development in both academic and clinical contexts. Training institutions who request clinical writing samples should provide information about how these materials will be handled, for what period of time they will be utilized, and how they will ultimately be disposed of after the application cycle has ended. 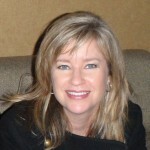 Sites may also provide their own guidelines to applicants regarding which details to focus on in their clinical writing samples (e.g., the client’s diagnostic conceptualization, interpersonal relationship history, or development of insight over course of treatment); such recommendations may assist students in reducing the scope of their clinical writing sample, and limit the number of potentially identifying details that they ultimately include. In addition to education and training provided by doctoral institutions, clinical supervisors at external training sites should include discussions and training about how and when to obtain informed consent from clients for the use of their information for the clinical writing process. The high frequency of students in this survey who reported that they would feel too “embarrassed or shy” to ask their clients for permission, is illustrative of how useful the assistance and guidance of clinical supervisors could be. Obtaining informed consent from clients to publish or present clinical information is considered preferable among many professional clinicians (Fisher, 2008; Blechner, 2012) and is a skill that could be addressed during clinical training using the type of checklist developed by Sieck (2012), who provides a decision tree of when requests for informed consent from clients may be appropriate versus contraindicated within the treatment. The current study is limited in terms of the representativeness of the graduate student population, which likely varies according to geographical location and type of program. A follow-up study investigating these issues with a larger sample of graduate students at various stages in training is needed to establish more broadly generalizable results. Additionally, it is recommended that future studies investigate the perspectives of clinical supervisors on the ways in which important issues related to client confidentiality – including supervisees’ use of clinical documents for application purposes – are handled within the supervision process and supervisory relationship. Such studies will lead to more effective graduate training and more specific, relevant, and useful guidelines for students, supervisors, training site faculty, and graduate program faculty who utilize clinical documents for professional training purposes. Ultimately, all faculty, clinicians and trainees have the same desired outcome in mind: to provide clients with the highest level of care. Lewis, K. C., & Samstag, L. W. (2014). Confidentiality practices of trainees applying for clinical training positions: A survey study. Psychotherapy Bulletin, 41(1), 19-30. American Psychological Association (2010). American Psychological Association Ethical Principles of Psychologists and Code of Conduct. Retrieved January 15, 2014, from http://www.apa.org/ethics/code/principles.pdf. Aron, L. (2000). Ethical considerations in the writing of psychoanalytic case histories. Psychoanalytic Dialogues, 10(2), 231-246. Barnett, J. E. (2012). Clinical writing about clients: Is informed consent sufficient Psychotherapy, 49(1), 12-15. Bernard, J. M., & Goodyear, R. K. (2014). Fundamentals of clinical supervision (5th Edition). Columbus, OH: Merrill. Blechner, M. J. (2012). Confidentiality: Against disguise, for consent. Psychotherapy, 49(1), 16-18. Duffy, M. (2010). Writing about clients: Developing composite case material and its rationale. Counseling and Values, 54, 135-153. Fisher, M. A. (2008). 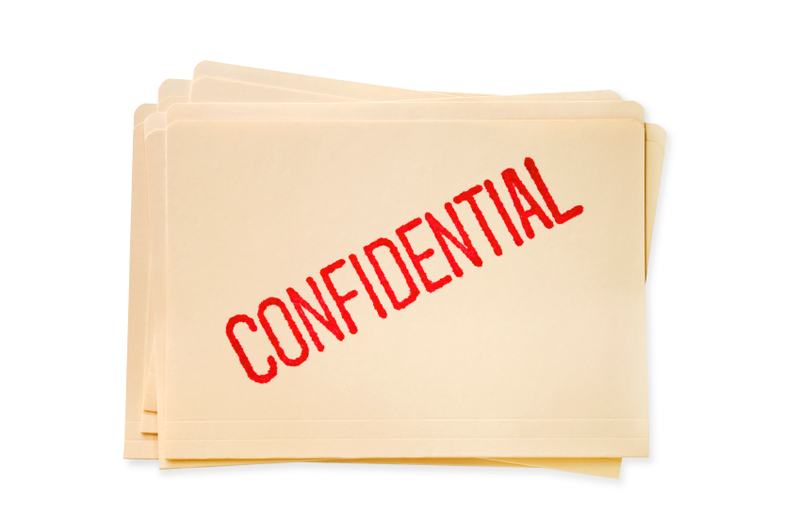 Protecting confidentiality rights: The need for an ethical practice model. American Psychologist, 63(1), 1-13. Fischer, C. T.(2012). Comments on protecting clients about whom we write (and speak). Psychotherapy, 49(1), 19-21. Gabbard, G. O. (2000). Disguise or consent: Problems and recommendations concerning the publication and presentation of clinical material. International Journal of Psychoanalysis, 81, 1071-1086. Kantrowitz, J. L. (2006). Writing about patients: Responsibilities, risks, and ramifications. New York: Other Press. Lewis, K. C. (2012). Presenting clinical case material for training purposes: Special ethical considerations for graduate students and their supervisors. 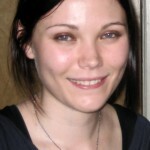 Paper presented at the 2012 Spring Meeting of APA’s Division 39 (Psychoanalysis), Santa Fe, NM. Lewis, K. C. (2013). Show, don’t tell: clinical materials and the internship application process. Paper presented at the 2013 Spring Meeting of APA’s Division 39 (Psychoanalysis), Boston, MA. Samstag, L. W. (2012). Introduction to the special section on ethical issues in clinical writing. Psychotherapy, 49, 1-2. Samstag, L. W. (2013). Clinical writing by graduate students: Ethical dilemmas and recommendations. Paper presented at the 2013 Spring Meeting of APA’s Division 39 (Psychoanalysis), Boston, MA. Sieck, B. C. (2012). The implications of obtaining clinical writing informed consent versus using client disguise and recommendations for practice. Psychotherapy, 49(1), 3-11. Sperry, L., Hartshorne, T. S, & Watts, R. E. (2010). Ethical considerations and options in publishing clinical case material. Journal of Individual Psychology, 66(2), 135-143. Thomas, J. T. (2010). The ethics of supervision and consultation. Washington, DC: APA Press. Woodhouse, S. S. (2012). Clinical writing: Additional ethical and practical issues. Psychotherapy, 49(1), 22-25. How Do Your Informed Consent Practices Measure Up? Informed Consent in Clinical Practice How Do Your Confidentiality Practices Measure Up?